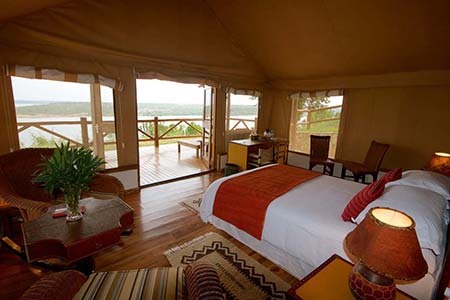 Mweya Safari Lodge is located on Mweya Peninsula found within Queen Elizabeth National Park in Western Uganda. It is recognised to be one of Uganda’s best accommodations with decent luxurious lodging facilities. It is located in an area that offers a seamless view of the fresh water Lake Edward together with Kazinga Channel from every angle of the lodge. The Lodge is positioned in the centre of Uganda foremost wildlife harbour. It is well-known for its numerous flora and fauna, wild life such as Buffaloes, Lions, Elephants, Water-bucks hippos as well as crocodiles. Their land is sheltered with savanna grassland along with woodland. Though the shared one is the Euphorbia species. The lodge has well planned lodging such as majestic cottages, executive cottage, luxurious all with private bathrooms, power together with Balconies offering a gorgeous outlook of the Kazinga channel. Among the amenities accessible at the lodge include Tembo safari bar completely kept, poolside bar, Kazinga restaurant with international and local cookery, swimming pool, DSTV as well as a reminder shop full of art and craft items. The lodge is fashioned with large dining room together with a lounge. The lodge can ideally work as a base for Uganda Safari activities around Queen Elizabeth National Park. Such tour activities include the boat cruise along Kazinga channel, game drive safaris in the park and chimpanzee trekking in Kyambura Gorge, bird watching and nature taking tours among others.